Biomass is set to play an increasing role in the supply of energy, both in the industrialised world and in developing countries, as concern for the state of the global environment grows. The possibility for the acceleration of commercial production has received support from the increasing involvement of the large power producers and the growing political commitments of several European countries. 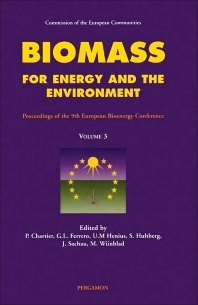 The 9th European Bioenergy Conference was held in Copenhagen, 24-27 June 1996. Interest in this conference series continues to grow and the event attracted around 700 delegates from 45 countries. In contrast to previous events, more emphasis was placed on demonstrating bioenergy technology in the marketplace. Overviews on recent achievements in commercial or near commercial activities formed the main focus of the event, but highlights of advances in science and technological development were also presented, in addition to papers covering environmental aspects of bioenergy. For researchers, developers, consulting engineers and policymakers in the field of bioenergy. Section headings: Volume 1. Opening Addresses. Primary Production of Biomass. Provision and Production of Solid Biomass Fuels. Processes for Large Central Power Plants. Processes for Decentralized Heat and Power Production. Processes for Production of Transportation Fuels. Market, Economic and Environmental Aspects of Bioenergy. Non-Technical Barriers. Primary Production of Biomass. Volume 2. Provision and Production of Solid Biomass Fuels. Processes for Large Central Power Plants. Processes for Decentralized Heat and Power Production. Volume 3. Processes for Production of Transportation Fuels. Market, Economic and Environmental Aspects of Bioenergy. Policies and Non-technical Barriers. The Johannes Linneborn Prize.